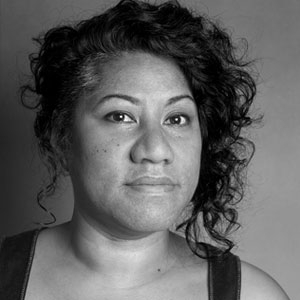 Latai Taumoepeau is a Punake, body-centered performance artist; her story is of her homelands, the Island Kingdom of Tonga and her birthplace; the Eora Nation – Sydney, and everything far and in-between. She mimicked, trained and un-learned dance, in multiple institutions of knowledge, starting with her village, a suburban church hall, nightclubs and a university. Latai activates Indigenous philosophies and methodologies; cross-pollinating ancient practices of ceremony with her contemporary processes & performance work to re-interpret, re-generate and extend her movement practice and its function in and from Oceania. She engages in the socio-political landscape of Australia with sensibilities in race, class & the female body politic; committed to bringing the voice of marginalised communities to the frangipani-less fore ground.